There is something I love about recording a voicemail greeting that says I will be out of the country, with no cell phone access, for a few weeks. Usually included is the customary, “You can try to reach me by email…” but even that was questionable. This time, I’d be traveling somewhere so remote it’s basically be off the grid. And that “something” I love about the voicemail? It actually has more to do with everything that leads up to the point of making the recording. The weeks of pre-planning and packing were over. The hours and hours of watching swell charts on the Internet, hoping to see a solid blob of swell pop up in the proper direction, and the incessant studying of wind graphs and forecast sites to determine what size kites and boards to take had all passed. The stresses of showing up late (as always) for the airline check-in, the roulette wheel of excess baggage fees and the long security lines had faded into faint memories. I sent my last farewell texts to family and friends, and finally, switched my phone and my contact with the everyday world… OFF. In our world of constant connectivity there is a very refreshing feeling that comes from truly being out of touch and unplugged. And yes, I know that for almost anywhere in the world, you can rent a pre-paid phone or search out a wireless connection. It was no different on this trip. But I had no need to rent a phone, other than letting my loved ones know that I had arrived, and I could do without the daily Internet drain. It was time to disconnect from the Web and reconnect with the ocean, the surroundings, myself and my friends. On this trip, I traveled as a guide with a small group of kiters and surfers put together through REAL Watersports. Our destination was a beautiful motu pension called Ninamu, part of the small atoll of Tikehau in the Tuamotu Archipelago. Tikehau has a little over 400 inhabitants, many of whom survive by fishing and gathering delicacies from the sea, such as lobster, sea snails, scallops, crab, urchin and more. We, however, were there for the wind which is known to be prevalent this time of the year. When we landed on the small airstrip on Tikehau we could already see the beauty and charm of the atoll. But better yet we could see the wind! Solid whitecaps filled the electric Jello-blue lagoon. As we stepped out of the plane the warm breeze hit our faces and gently whipped the coconut palms into a welcoming Polynesian wind dance. With no security or baggage claim at the small airfield we simply grabbed our baggage off the tarmac, jumped in the truck and, within minutes of landing, began loading our gear into the boat that would take us to our final destination. Being that we were there to kite, however, we pulled out all of the necessary gear for a session, quickly built-out our boards and launched straight from the harbor for a downwind run to our home for the next two weeks. The wind was steady and the warm salty water was the perfect way to wash off hours of air travel and reinvigorate the mind and body. In all of my travels it was by far the best way I had ever arrived at a destination. We spent the following days living the island-style life: fishing in the mornings and evenings; kiting in the afternoons; exploring the reefs, motus, and waters with masks and fins, kites, boats and by foot – we tried to take in as much of the beauty, culture and heritage the beautiful atoll had to offer. Aside from getting to explore a new kite spot, which is always exciting, two of the most impactful moments for me were successfully spearing dinner (and breakfast) with a Hawaiian sling, and swimming with graceful giant manta rays as they effortlessly circled the coral outcroppings in the center of Tikehau’s lagoon. On our final morning we awoke to an amazing sunrise and a welcoming wind texture on the water. We did most of our preliminary packing and loaded the boat, keeping out only the gear we would need for one final kite mission. The wind was up, but the weather was squally forcing us to hunker down under the lone palm tree at our chosen launch beach. After an hour or more of waiting in the relentless tropical rain we saw a window. The rain let up and the clouds thinned out allowing us one final cruise through the beautiful blue lagoon, a perfect ending to an amazing adventure. Throughout the entire journey home I kept finding myself smiling as I recounted all of the laughs, the sessions, the sunsets and the new memories that had been made. And, as excited as I was to turn off my phone off and disconnect at the beginning, I found myself equally excited to turn it back on and reconnect with family and friends, if for no other reason than to plan the next adventure. 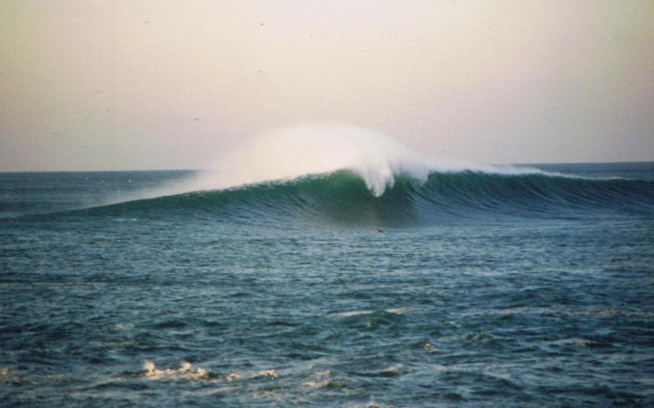 Jason Slezak is a Patagonia surf ambassador and Pennsylvania native who moved to Cape Hatteras, North Carolina for the surf. 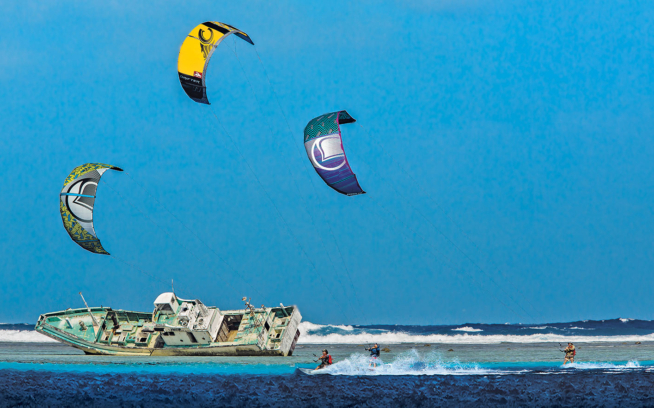 Kiting became a way to get in the water on windy days, and he was “instantly addicted.” He is the co-creator and co-organizer of the Triple S Invitational – an internationally recognized kiteboarding contest.